Recently in my previous post I have told you about PDF search engine to search pdf files, now in this post you will came to know how we can easily search Manuals with the help of “THE MANUAL” search engine. If you bought some new products then you defiantly need manuals to know how to use that product. Most of the time manuals comes with product itself, sometime manual may not comes. On that time we need to search manuals online itself. We can get manuals easily by visiting official website, but if you are looking for something which you have not yet bought then you can make use of The Manual search engine. 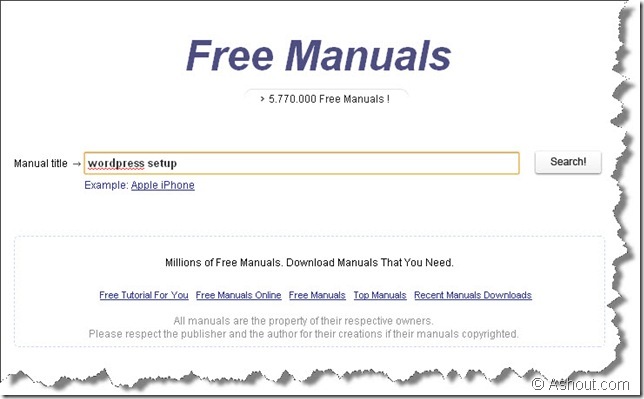 The Manual is a free online service where you can search manual e-books for free. At present The Manual search engine has 5.770.000 Free Manuals stored in their data base. It is easy to use, free and no signup is required to use their website. 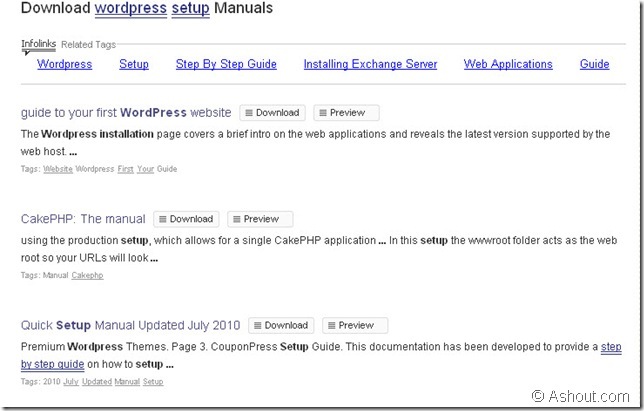 To search manuals, just enter the manual term in search box to search and click Search! In my case I’m searching for “WordPress Setup”. After clicking Search! button it will take you to result page, scroll below of the page to see actual result. There are two option you will see in result page, one is Download and another is Preview option. If you click Download button it will directly take you to the pdf converter website (If the result is webpage) to covert that webpage into pdf file. Wait for few seconds on that page, it will automatically converts that webpage into pdf file and opens that pdf file in Pdf reader what you have installed. If you click preview it will opens that page where can see preview, and if you interested you can download that file by click on “Download this PDF from source” option which is available at the top navigation menu. This “The Manual” search engine displays both web pages and PDF file in their results. If the result is webpage then it will takes you to pdf converter website to convert it, else gives the direct download link of that Manual PDF e-book. If you are trying to search any manuals then you can give it a try to this free online service.